In other posts we looked at the importance of isolation, PPE, decontamination, ways to minimize exposure to Ebola, anti-virus hygiene, incubation periods and quarantine. All of these are practical ways of fighting Ebola from a prepper’s standpoint. This post will speculate about what plague will look like in the modern world. What would happen if half of all people didn’t show up for work? How long would a Ebola plague last? How would it likely end? What would plague look like in the modern world? Nobody knows. We’ve never seen it. We’ve seen limited outbreaks in Africa. We’ve never seen a large scale plague hit America in the modern age. The closest we had is the Spanish Flu in 1918, which ultimately infected one-third of the world’s population and killed more people than WWI. Experts classify Ebola as a slow spreading virus which baffles me because in parts of Africa the number of confirmed cases is doubling every 20 days. That’s like saying a jackrabbit is slow! At those rates by the time 1 million people had the disease in America it would only take 160 more days to infect nearly every American. An Ebola plague would happen over 6 months or more. This isn’t something hitting quickly and ending quickly. It could easily last one or two years. Worst case scenario in America is 150 million dead. That would be a huge hit but civilization would continue. We wouldn’t revert back to pioneer times. Even with only a few million Americans infected, the blow to the economy would be devastating. Airports would close. Tourism and public entertainment would cease to exist. Shopping centers would be empty if not locked down. People would stay home and not spend money. With people not spending businesses would fail or close their doors. Many workers would be laid off. This would have a negative cascading effect on the economy. In the Spanish Flu, people were stoic. They went about their work. I don’t know if that would happen today. Without income from employment, many people would run out of money to purchase food. Food would become scarce in supermarkets. Those with money would hoard food and buy up all they could. The distribution chain would be compromised by the lack of workers. Would people loot? Police forces would have reduced capacity because many police officers would be ill. The military would be deployed to police major cities if looting became a problem. The government would distribute food if the traditional supply chain broke down. Would there be enough? Impossible to predict. Local and city governments should still have the resources to keep water running. Private wells should be fine. Sewer systems should continue to work. The private companies providing electrical power would be challenged. Power outages could occur and take longer to repair. Hospitals would be overwhelmed. America is committing $1 billion to fighting Ebola in Africa. If Ebola comes to America in a big way, the government will spend trillions. A vaccine could be developed ending the plague. The virus could mutate into a less harmful variation. This is common. If a virus is too deadly it kills off its host and dies itself. The experts believe Ebola is fully containable and these worse case scenarios won’t happen. What we can predict with certainty: There will be other viruses in the future and some could make Ebola look like the common cold. Ebola is a horrible virus which kills 50% of those infected. By virus standards, Ebola is slow spreading and isn’t transmitted through the air. There are more dangerous viruses out there which would be far more difficult to contain. Regardless of how the Ebola story unfolds, preppers should prepare for plagues and future infectious diseases. In Part 1 of How To Survive Ebola, we looked two of the most important things you need to do to survive a viral plague. The most important was ISOLATION. You need to isolate your family from contact with others. I offered some guidelines about WHEN to isolate your family. That’s an important real world consideration. A major outbreak of Ebola or any infectious disease won’t happen overnight. There won’t be a sudden event to warn you it’s time to isolate your family. The transition time when you must isolate your family is particularly dangerous. Isolate too late and you risk bringing Ebola into your home. Isolate too early and you risk losing your job and burning through your valuable stocked resources before they’re really needed. This will be a theme of this post: The danger of transition periods and how to deal with them. Even if you cannot achieve full isolation, the less contact your family has with others during a virus outbreak lessens your exposure. If you must, go to work, go shopping, run the necessary errands of life, but cut back on social activities where you’re exposed to large numbers of people needlessly. Once your family is in a state of isolation during a MAJOR spreading of plague, IF you must venture out, I recommended wearing protective clothing. This is known as PPE or personal protective equipment. In layman’s terms, a plastic suit thingy. It’s important to match your PPE to the risk you face. This post from PKSafety.com explains Ebola PPE in more detail. ThoughfullyPrepping has a good post about realistic Ebola PPE for preppers. This next resource isn’t required. 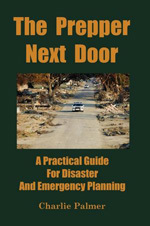 It’s a guide (pdf file) for PPE for emergency responders. As with many government documents, it could be condensed to 1/10 the size! In the book, I write about what I call a CULTURE OF SURVIVAL. It encompasses many things. You must have the right equipment. You must have the skills and training to most effectively use the equipment. You must have the correct mental attitude and knowledge of the situation you’re in. Only when these things come together do you have the best chances of survival. The use of PPE against an infectious disease is a perfect example of this. If you follow poor procedure when donning or removing your PPE, you risk exposure to Ebola. This graphic shows “suiting up” in PPE. Removing your protective gear is even more critical. This is the chance for any Ebola on your suit, respirator, gloves or other equipment to get on you. Ebola currently cannot spread through the air (unless somebody sneezes a big goober in your face). Ebola can’t be transmitted through the skin. Ebola will strike through open wounds, the eyes, the nose and mouth, and sexual activity. Remember the post about attack vectors? These are some of Ebola’s attack vectors. In our previous post, Equipped Cat reminded us we need to protect our animals from becoming infected. That led me to learn a bit more about Ebola. In Africa, other attack vectors are infected bush meat and bat bites. Equipped Cat is right. Isolation applies to your animals. How likely are we to be infected by mice or mosquitoes? I don’t know, but it’s a valid concern. DECONTAMINATION is important. I suggest purchasing simple plant sprayers, filling them with a mixture of water and bleach, one cup of bleach to a bucket of water is fine, and spraying down your protective suit before removing it when you return from your expedition. This bleach spray will kill Ebola on your suit and minimize the risk of becoming infected when you take the suit off. It will allow you to reuse your protective suit, which for most preppers will be a limited resource. As individual family preppers, we don’t have the financial resources to dispose of our PPE after every use. We must balance what are called “best practices” with practical reality. Aid organizations follow this same procedure on a larger scale with rooms where you walk in and are sprayed automatically, usually with some chlorine based solution, before you walk out. Two nurses treating Ebola patients have died despite wearing protective equipment. It’s believed in one case the nurse inadvertently touched her nose while removing her gear. A bleach shower could have prevented this kind of infection. Rubbing our nose or putting our hands up to our face is a natural thing we do without even thinking about it. Overcoming our natural tendencies is one of the most difficult things to learn when becoming indoctrinated in a particular culture of survival. Don’t run from snarling dogs, don’t claw at a scuba mask underwater if you feel claustrophobic, and don’t put your hands up by your face when working with PPE and Ebola! Don’t become complacent just because you did something once before. Treat your hands like loaded weapons when removing PPE. Be slow and methodical. Do you really need bleach? For me personally, yes. It’s one more layer of defense. Ideally, if you follow perfect procedure, you should be able to remove a hazmat suit contaminated with Ebola and you should be fine. This should even apply if somebody threw a bucket of infected vomit, diarrhea, and blood on your suit. This layering is why two pairs of protective gloves are sometimes used. The outer layer of gloves is certainly contaminated. You don’t want to remove it with your bare hands. You remove it with one more protective layer. Each layer has less exposure. After removing PPE, it’s recommended you wash your hands. If gloves are to be disposed of, you should roll them up inside out for disposal as removed touching as little of the outer part of the glove as possible. If gloves are to be reused, place them outside exposed in sunlight. Put them over a couple of sticks stuck in the ground. The UV light of the sun kills Ebola. Between bleach and UV light, take that Ebola! This post has hit nearly 1,000 words and I’ve only touched on a fraction of what I planned to write, so in Part 3, we’ll continue with a discussion of incubation and quarantine. We’ll look at the rate at which Ebola is currently spreading in Africa and what plague would look like in America. Preppers are in the news because of their Ebola preps. How should preppers prepare for Ebola? The same advice applies to many disasters: Stockpile food and water and prepare to sit out a crisis. ISOLATION is your number one defense from Ebola. Stay home. Hunker down. Avoid unnecessary contact with others. Keep your family at home. With many things timing is the key. Staying home right now makes little sense. Your boss won’t be happy and you could lose your job. There is no immediate risk. If you wait too long, you could be infected and carry the disease home. My advice: Wait until at least 10 to 15 people in your city have been diagnosed with Ebola. The odds are you won’t have been exposed yet. Even 100 confirmed cases implies relatively small risk to you. By all accounts Ebola doesn’t spread too easily yet. By the time 1,000 people are confirmed in your city, it could be too late. By 10,000 to 100,000 it’s too late. If you live in the country, you’re probably safe until your local town has confirmed cases. Then it is certainly hunker down time. Timing is everything. Working folks can’t just stay home because of one or two cases. It’s not necessary yet. Do identify a point beyond which you’d put your isolation plan into practice. Your second line of defense, if you go out after a major spreading of the disease is to wear a protective suit, face mask, and gloves. When you return to base (home), spray yourself with a mixture of 10 parts water to 1 part bleach. That should kill any Ebola that decides to tag along. If a major spreading of Ebola would occur, you’d want to hunker down for as long as possible. Preppers who have 4 to 6 months of food and water stocked would be safest. ThoughtfullyPrepping has a nice series of articles about Ebola. Safety should be priority number one for preppers. Is what you’re doing safe? Can I do something better to protect myself better? What happens if something goes wrong? Do I have adequate backups? Ask yourself these questions with any high risk situation. In the news, a car buff was killed when his scissors jack failed. This is Autoshop 101: Never work under a car only supported by a jack of any kind. Jacks fail. Professionals have lifts. Those of us working out of home garages will have a floor jack and jack stands. Hydraulic jacks fail. Screw jacks fail and aren’t sufficiently stable for anything more than raising a wheel to change a tire. I prefer jack stands with pins to ratcheting stands. Ratcheting are acceptable though. For car owners, I recommend the Sears Craftsman Professional 4 ton ratcheting jack stands. They’re only about $35. They’re made in China, but appear well enough made. They have a wider and more stable base than the more common 3 ton jack stands. For larger vehicles, Harbor Freight Sells ratcheting jackstands in 6 ton and 12 ton capacity. While Harbor Freight gets a rap for producing cheap Chinese crap, these jacks appear well made. Find a coupon to get the 6 ton stands for $40. I reviewed the 3 ton Torin “double locking” stands on Amazon and wasn’t too impressed. The pins were poorly positioned. The welds looked like crap. I shared some photos there to show what I mean. I gave some hints for inspecting new ratcheting jackstands in that review. One thing you can do is purchase two sets of stands, inspect them all. Mix and match and return any parts that are unacceptable. Is the pawl straight or crooked? Are any of the welds poor? Jackstands shouldn’t have much rust on them. Maintain them. While at it, be darn certain the jack points on your vehicle are solid and not rusted. Rusted jack points collapse. You should know where all jack points are on your vehicle and where you can place stands. The metal the suspension support is attached to is solid. I haven’t seen it myself, but I’m told some newer high-end cars don’t have jack points for floor jacks! They’re meant to be serviced on a professional lift. The same point for lifting and supporting. How’s that for really screwing the DIYer? I’ve ranted before about how the automakers want us dependent on dealer repair. This is one more example of that. Jack stands fail too. One issue is that many of the bars are cast metal and cast metal can crack. This is why I love backups. Get two pairs of stands and place a second set as a backup. It takes a bit of time but gives you much better safety. This is a mathematical fact: If one stand has a 1 in a thousand chance of failing, the chances of two failing at the same time is one in a million. Most stands are far safer than 1 in a thousand. The chances two stands will both fail on you is about the same as winning a huge lottery. It won’t happen. One more thing. Chock the wheels so the vehicle can’t roll. For $7 Harbor Freight makes great wheel chocks of solid rubber. Back them up with sandbags. Jack stands can physically break. Much more common though is a car isn’t solidly placed on the stands and it slips off. The stands must sit on solid concrete. Not soft ground. When you use ratcheting type stands, the lower the bar the better and more stable. Do lift the bar so the pawl engages the first notch. The stands aren’t designed to sit just on the top of the stand. In the book I recommend 12,000 pound rhino ramps. It’s really just 3,000 pounds per ramp. 12,000 pounds per vehicle. The design has changed. The new ramps are stackable. They take less storage space. This is a great example of dumb engineering. Stupid. Stupid. Stupid. For a bit of convenience, we’re asked to give up a solid structure under the ramp. I no longer recommend the new ramps. Blitz the company making the older style ramps went belly up because of lawsuits. Not because of ramp failures! Blitz makes gas cans. The old school gas cans. They had a snout and you poured the gas out. The problem was some people poured their gas onto open flames. They spilled gas and left the cans near water heaters or other sources of flames. The flame worked its way into the gas can. New gas cans have devices to prevent flames from burning back into the can. For most of my life we used the old style can with complete confidence. Common sense and caution in your own behavior is always your first and best line of defense. The vanishing of Blitz USA-made old school rhino ramps illustrates another principle I harped on in the book. Just because something is available today is no reason to assume it will be available in the future. If you purchase something you really like and rely on and if you can afford it, purchase a backup. Prepper lesson: Have backups. Allow for failure. Be safe.